One of the most popular destinations in Budapest is Gellért Hill, which is worth admiring both from a distance and up-close. If you climb the hill, the wonderful panorama of Budapest unfolds before you and you will feel like you are amongst the clouds. There are terraces along the walkway up the hill, so you can stop for a rest to admire the view. At the start of the walkway, you will see the fantastic Cave Church, while at the end, stands the monumental Statue of Liberty, one of the symbols of Budapest. 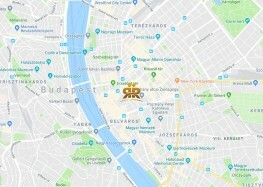 You will surely spend a little time at the top of the hill admiring the breath-taking view, and when you return to Szent Gellért tér, you can get a good rest in the Gellért Bath. The Gellért tér is not only an important destination because of the particularly beautiful Gellért Bath. You can find plenty of good restaurants, cafés and breakfast spots near the square. This area has become one of the most popular and atmospheric centres of Buda in recent years.